Deep in the nucleus in the heart of every cell in our bodies lies the real family jewel: the genetic code that makes us the living, breathing miracle we are. Deep in the nucleus in the heart of every cell in our bodies lies the real family jewel: the genetic code that makes us the living, breathing miracle we are. + Built up over millions of years, generation after generations of instructions contributed by our ancestors are knitted together one after the other. Failures tossed out, successes reinforced, we surge into a future with our leafy, fishy, scaly, boney bodies into a world littered with possibility and disaster. – So it should come as no surprise that this antique system would inevitably breakdown on occasion. 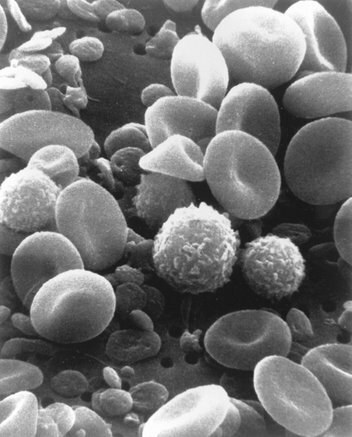 One particular breakdown, a riot of blood cells formed in over-heated production, are the myeloproliferative neoplasms. And the destructive endpoint of those blood cancers is occasionally a vicious killer, MF, myelofibrosis. – The hard wiring of our survival makes such a breakdown unlikely. The production of blood takes place largely in our marrow, a stew of fat, hormones, stem cells, blood vessels and enzymes, in a capsule shielded by thick membranes and a castle wall of solid bone with few opening to the outside world. A series of signals from that outside world calls for more oxygen-bearing red blood cells, more disease-fighting white cells, more clotting platelets. – There are fail-safe and backup systems in blood production so almost all the time the production line work on a Just In Time basis, delivering the goods where needed. To get a handle on how things can go wacky you’d have to shrink down to a dot a million times smaller than a pixel on your computer screen and descend deep into the body’s most secret recesses. – That’s where the action begins. + The cytokines, on the surface of the cell, are linked to specific enzymes inside the cell, proteins whose function is to stimulate a process, make something happen. Until called on by the cytokines they pretty much wander around the cytoplasm aimlessly. There’s a family of these enzymes called the Janus kinases, the JAKs. – The JAK2 enzyme can communicate orders from the surface of a blood- making stem cell into its cytoplasm. But to create something we need reproduction and that action takes place in the heart of the nucleus. To get to theMagicKingdomyou have to follow the yellow brick road, the road marked “JAK/STAT Pathway.” STATS (Signal Transducers and Activators of Translation) are also proteins, neighbors of the JAKs floating along in the cytoplasm. Unstimulated they are inactive. But when the JAK kinases get the signal from surface cytokines they shake up the STATs with a shot of phosphate. + Phosphate is an ancient word meaning bearer of light, conveying magic explosive charge and flashes of light. It’s an apt description of what happens next. This phosphate charge, or phosphorylation, lights up the STAT and causes it to join with another STAT and, locked together, penetrate the cell nucleus . Once there, they translate coded orders that turn on genes that produce the cells. – JAK kinases are vital to many biochemical signaling functions, including blood production and immune system functions So it was big news when, six years ago, several independent research labs, working with new data from the Human Genome gene sequencing project, identified a defect in the JAK2 enzyme, that seems to crop up frequently in the blood of MPN patients. Somehow, in the process of reproduction, a JAK2 enzyme – at position 617 — switched two amino acids, valine and phenlyline creating a mutation, JAK2V617F This mutation had the effect of spontaneously activating downstream STAT, in effect a switch turned continually to the ON position, stimulating blood production. – With a therapeutic target at hand, labs started working on drugs to turn off this JAK2 kinase so it would no longer stimulate the STAT proteins to penetrate the nucleus and write up reproduction orders. Without much success. Even more bewildering, JAK2 inhibitors were about equally effective in MPN patients who were negative for the mutation as well as those who had the mutant clone. And that may have been the secret behind Ruxolitinib’s success. The JAK-STAT pathway is dysregulated in MF. Putting it another way, the JAK2-STAT pathway is ON in all myelofibrosis patients, JAK2 positive or not. As a result all MF patients have high levels of inflammatory cytokines (those GPS runway lights burning in the night) and JAK1, JAK2, and STAT are fully phosphorylated. – Ruxolinitib – compound “(R)-3-(4-(7H-pyrrolo[2,3-d]pyrimidin-4-yl)-1H-pyrazol-1-yl)-3-cyclopentylpropanenitrile phosphate — contains a finely tuned amalgam aimed at the JAK-STAT pathway itself via the JAK1 and JAK2 kinases. The compound is designed to disrupt the JAK-STAT pathway by acting on the cell surface cytokines. One effect of this approach is the reduction of pro-inflammatory cytokines responsible for many of the symptoms reported by MF patients and the rapid and durable spleen size reduction. + © Zhenya Senyak and MPNforum.com, 2011. Unauthorized use and/or duplication of this material without express and written permission from this blog’s author and/or owner is strictly prohibited. Excerpts and links may be used, provided that full and clear credit is given to Zhenya Senyak and MPNforum.com with appropriate and specific direction to the original content.